Even as the fatalities from the last deadly terrorist bomb attack on Beirut’s southern suburbs were being counted, the latest addition to the string of volcanic eruptions that interspersedly emanate from the political and media spheres of those opposed to the powerful Hezbollah movement began to seethe. As expected, it was void of anything to do with the depths of condolences that should be offered to the families of those killed, or even updates on the potential setting-up of blood donor banks for the dozens maimed in the atrocity that targeted innocent civilians. Instead, the latest gripe was premised on accusations that Hezbollah was arbitrarily erecting a ‘fortress-like’ security zone around its constituency areas in Beirut—as a barrier to ward off the potential for another attack taking place. Now considering the severity of the situation in the country and the vulnerability of Hezbollah, an open protagonist in two conflicts in and outside of Lebanon, to potential bomb and missile attacks from Al Qaeda-affiliated extremists, the nature of these accusations certainly warrant a little clarity. Preceding the 2000 liberation of South Lebanon and for a short while after, Hezbollah indeed had de facto security zones in collaboration with the Lebanese army in Dahiyeh (Beirut’s southern suburbs), as well as autonomous positions which they still secretly maintain, proximate to both the southern border with Israel and the eastern one with Syria. However, in the period that followed the 2000 liberation and even in the aftermath of the 2006 war, Hezbollah voluntarily acquiesced to demands that it give way to joint security controls with the Lebanese army in the manning of these overt security positions, particularly a special security zone located in the neighborhood of Haret Hreik—the epicenter of the movements political administration. This is not to say that Hezbollah played no part, or was not involved in, the coordinating of intelligence with the state authorities for the protection of these sensitive locations. Being the most powerful military force in the country, with armaments, capabilities, logistics and technical knowhow that supersedes the fragile Lebanese military almost five times over; it was only natural that it contributed to these efforts by virtue of its successive designation as the country’s ‘national resistance’. Although resulting from of its tactical victory in the 2006 war against mighty Israel, Hezbollah had all but neutralized any serious threat of overt and covert attacks on its sensitive locations in the country; the foreign-backed civil war in Syria changed the equation drastically. 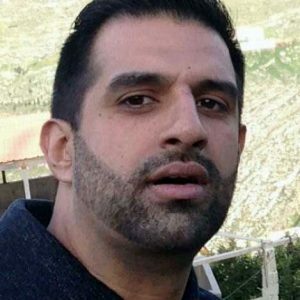 Threats of retribution on the part of Al Qaeda-linked groups against Hezbollah for its assistance to the Syrian armed forces in specific battles soon became a reality. 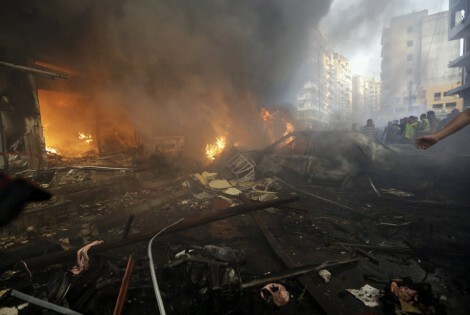 What began as the indiscriminate firing of crude rockets and roadside bombings directed at Hezbollah interests in its constituent areas of Beirut and the Bekaa valley culminated into two massive car bombings on its suburban Beirut stronghold, the last of which killed at least 27 innocent civilians on August 15th. The location of the attacks were obviously designed to render the movement’s largely Shi’ite support base into a perception that the cost of supporting them has become too exorbitant, and the only way to avoid further calamities is to pressure them en masse to disengage from the Syrian conflict. 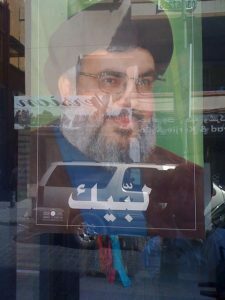 And with Hezbollah acknowledging the terrorists game plan, it exerted efforts beyond the nominal joint state-resistance agreement to share security, to prevent further attacks which the culprits executed largely owing to the lack of overt preventative measures previously employed by Hezbollah. If their adversaries are to be believed, you’d get the impression that Hezbollah was unilaterally setting up a garrison state, erecting infantry fortifications, building fences and walls ringed with electrocution wires and deploying vigilante groups to administer population lock downs and interrogation dungeons, all in the quest for absolute security. The idea behind the carefully worded propaganda is to present a picture of the movement manipulating the threat of terrorist attacks in order to set up autonomous zones akin to that of a state-within-state. In reality, the movement hasn’t even remotely established anything their adversaries have gone to great lengths to depict, despite the type of monstrosity which al Qaeda and its evil breed promulgated most vividly on that quiet evening last month. Truth be told, the overt measures are a mere composition of extra security cordons at almost every entrance to its suburban strongholds and manned by both civilian and uniformed individuals from its affiliated “Union of Municipalities of the Southern Suburbs”, in liaison with security and intelligence personnel from the Lebanese state and Hezbollah itself. The stopping and searching of almost every individual and vehicle intending to enter Dahiyeh, both for the iterative process of cross-checking identification as well as using bomb-sniffing dogs and sophisticated detection devices to check for explosive ordnance. Random stop and searches of suspect individuals in close proximity to these very check-posts or streets leading towards them, fearing they could be terrorist reconnaissance missions. The imposition of semi-permanent concrete Jersey barriers, a maze of metallic steel security barricades and mobile road blockers all designed to thwart the potential for land borne attacks such as suicide vehicle bombs. The requesting of feedback from residents of the area with regard to their vehicle/s registration and type, a measure used to prevent unidentified vehicle parking as well as intercepting unauthorized ones. Naturally, considering the residents of the densely populated southern suburbs amount to just shy of one million people, the increased security arrangements will, by virtue of their very nature, both occasionally clog streets with cars awaiting entrance and make some disruption in the everyday movements of people. But the counter-argument is that anything but these measures will furnish potential Al Qaeda-inspired car bombers with unfettered access to their localities, which would amount to a suicidal course of action considering their precedent so far, like that in Iraq where they’ve mercilessly slaughtered thousands, is rooted in only two-gear shifts: brutalize or kill. In this regard, and as any serious analyst of the country’s security dilemmas would note, it’s difficult to fault Hezbollah for their concurrent preoccupation with preventative security. The show of organized force at entrances to Dahiyeh is not about Hezbollah trying to isolate itself and/or its vote bank. On the contrary, it’s clearly an attempt by the movement to raise residents morale vis-à-vis the conflicting feelings that some will no doubt be having concerning the striking of a correct balance between individual safety and the liberty to carry out the the errands of daily life. The unprecedented security measures are also designed to send an uncompromising message to those who orchestrated the bombings, that it’s they who will ultimately feel the despair of their actions, as Hezbollah will now readily be thwarting them without any concessions on the part of the movement’s leadership. Despite the car bomb phobia gripping the country, no surprise considering the cross-sectarian nature and indifference of targets being hit in major cities, the aftermath of Hezbollah’s measures are still rife with accusations of what some perceive as their heavy-handedness. The brief detaining of two Saudi nationals and a very recent gun battle near a Palestinian refugee camp that left one dead and five others wounded in the broader vicinity of the southern suburbs, are now being highlighted to arouse ill intent against the movement and its new security deterrence. But the ultimate line is that since there is, and will continue to be for the foreseeable future, a lingering threat of further attacks targeting Hezbollah and its support base in the country, it’s only natural that the movement reserves itself with the means (in the absence of a credible state alternative) to anticipate, adapt and respond to the rapidly changing security environment that it’s now confronted with.